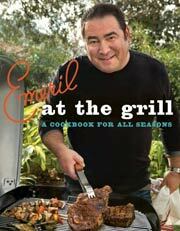 Sure, you can set out all the fixings for these grilled vegetable stacks and let guests to do their own thing, just as Emeril instructs. Although if you’re heading out for a picnic—or simply have lazy friends—consider instead making a single stunning sandwich using an entire loaf of ciabatta. Split the ciabatta in half, as you would a sandwich roll or bun, and remove a little of the inside crumb to make way for all the other stuff. (Wait! Don’t throw out the bread crumbs! Save them for coating cutlets or sprinkling over baked vegetables.) Then layer on the grilled veggies and the vinaigrette, wrap the whole shebang in waxed or parchment paper, and let it rest in the fridge for as long or as little time as you have to spare. If desired, weight the sandwich with a heavy skillet to smoosh all the flavors together. Wait until just before sharing to carve it into as many wedges as needed. 1. Preheat a grill to medium-high or turn on the broiler. 2. Place the eggplant slices on a wire rack or in a large colander. Sprinkle lightly with salt on both sides. Set aside until the eggplant begins to release beads of moisture, maybe 15 to 20 minutes. 3. Meanwhile, brush all sides of the peppers with some of the olive oil. Grill or broil the peppers, turning them occasionally, until they’re blistered and lightly charred on all sides. Place them in a bowl, cover tightly with plastic wrap, and set aside to steam while you heat the remaining vegetables. 4. Insert toothpicks horizontally through the onion slices to hold them together. Pat the eggplant slices dry with paper towels. Brush both sides of the eggplant, zucchini, yellow squash, and red onion slices with the remaining olive oil and place them on a large baking sheet or platter. Season with kosher salt and black pepper to taste. Grill the vegetables, in batches if necessary, until they’re lightly charred on the edges and nicely marked on both sides, 10 to 15 minutes. Transfer the grilled vegetables to a platter and set it aside. 5. Slide the skins off the bell peppers and discard the cores and seeds. The peppers should separate into nice wide strips. (If necessary, rinse the peppers in a little water to remove any excess charred skin.) Add the peppers to the platter with the other vegetables. 6. In a small bowl, combine the goat cheese, garlic, extra-virgin olive oil, and basil, and stir until well combined. Season to taste with kosher salt and black pepper. 7. Lightly toast the ciabatta just to warm it through, either on the grill, under the broiler, or in a toaster. 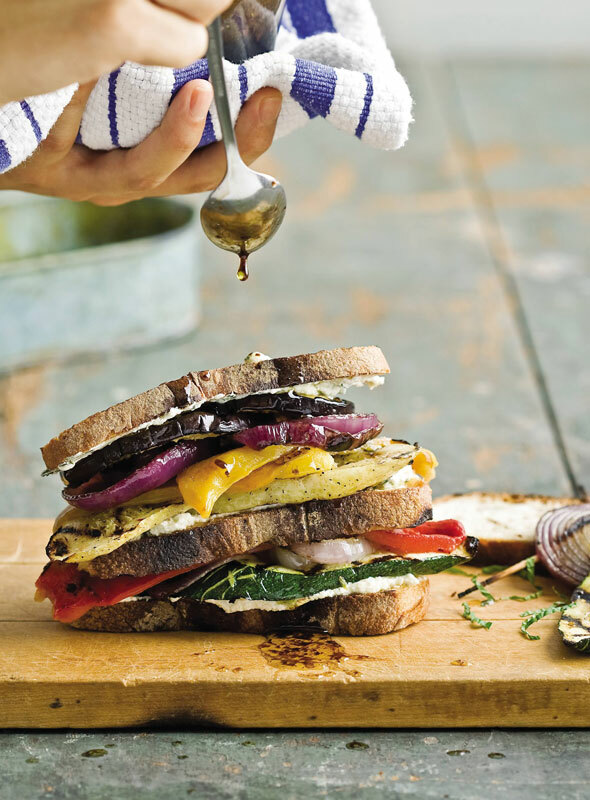 Grilled Vegetable and Goat Cheese Sandwiches Recipe © 2009 Emeril Lagasse. Photo © 2009 Steve Freeman. All rights reserved. All recipes and photos used with permission of the publisher. This is a quintessential summer sandwich. Using the vegetables at the peak of their ripeness provides such great flavor, you wouldn’t even miss the cheese if you left it off! However, the cheese spread is fantastic and could stand alone on the toasted bread for a twist on crostini, or even as a dip for crudités. This is a nice solution for a summer dinner with the family. I put everything on the table, and we prepared our own sandwiches with different kinds of whole-wheat bread and ciabatta. Since we love grilled veggies, I doubled the quantities for some of them and also prepared more cheese spread. The sandwiches are delicious with the Balsamic Vinaigrette and work with all kinds of bread. This is a keeper! Simple and delicious. I grilled the veggies and set out the goat cheese spread with some sourdough (couldn’t find ciabatta at my bakery) as part of a larger sandwich buffet. My guests assembled their own sandwiches. This recipe was originally included for a vegetarian guest at my luncheon, but even the non-vegetarians piled on the veggies and spread the goat cheese mix by itself on the sourdough. The assembled sandwich was outstanding, though — and perfect for a hundred-degree day. Light, smoky, tangy from the vinegar and goat cheese, and slightly sweet from the caramelized onions — I’ll be making this again! This was an excellent way to enjoy in-season vegetables, and the sandwiches made for a light, meatless dinner. The basil goat cheese is such a nice complement to all of the vegetables. I found that it was great without the bread as well (nice to remember for my gluten-free friends). I thought the vinaigrette was on the oily side for my taste, so next time, I’ll cut back on the olive oil (using instead a 1:1 ratio with the vinegar). Otherwise, the recipe is great as-is! I halved this recipe, since I knew my daughter and I would be the only ones eating it. I baked some ciabatta bread from Peter Reinhart’s Artisan Breads Everyday for our sandwiches. We liked the goat cheese spread with the Balsamic Vinaigrette and grilled veggies. All the flavors mingled together nicely. Makes a great summer lunch or supper. The leftover grilled veggies were great warmed as a side dish for supper the next night. This is a very versatile recipe. One can adjust the seasonings and even make a vinaigrette with a different vinegar and combination of herbs. I followed the recipe for the first sandwich I made, but I found the balsamic vinaigrette too overpowering. For the second sandwich, I added some salt, basil, oregano, and red pepper flakes to the grilled vegetables while they were still warm. I rubbed some garlic on the warmed ciabatta and drizzled it with just a teaspoon of the balsamic vinaigrette. I added some extra garlic and basil to the goat cheese, too, before I assembled my sandwich. The second sandwich was more to my taste. This recipe was easy, yummy, and left you craving more. I would mix the goat cheese with the garlic and seasoning as soon as you can, in order to give the garlic some time to infuse the goat cheese. And if you drizzle the olive oil into the vinegar while rapidly mixing, the vinaigrette will not break…this recipe just had the cook mix everything together. I was shocked to see that the recipe called for the peppers to be rinsed under water…this would wash away any roasted yummy flavors. Please do not rinse your peppers! This sandwich was a lot of work, but worth the effort. The sweet grilled vegetables, combined with the tang of the goat cheese, the vinegar dressing, and the bite of the basil, was a very satisfying combination. The texture was also nice, with the crunch of the slightly toasted bread and the softness of the cooked vegetables. My only quibble is that the ciabatta bread was not very tall, so the surface on which to pile the vegetables was very small, and I had a lot of vegetables left over. I really liked the flavors that came together for this dish. The instructions are simple, direct, and easy to follow, and the final dish works well. It’s a little messy, so I liked the leftovers even better. I ended up with about three cups of leftover veggies, about a half cup of goat cheese mixture, and some dressing, so I cooked a half pound of fusilli and mixed the leftovers with that. I added some fresh tomatoes for really delicious leftovers that were less messy and still captured all the flavors of the original dish. So it works as written, but I liked my use of the leftovers better. The flavor combination of grilled vegetables, balsamic vinaigrette, and goat cheese is delicious. This sandwich would be great for picnics or parties.